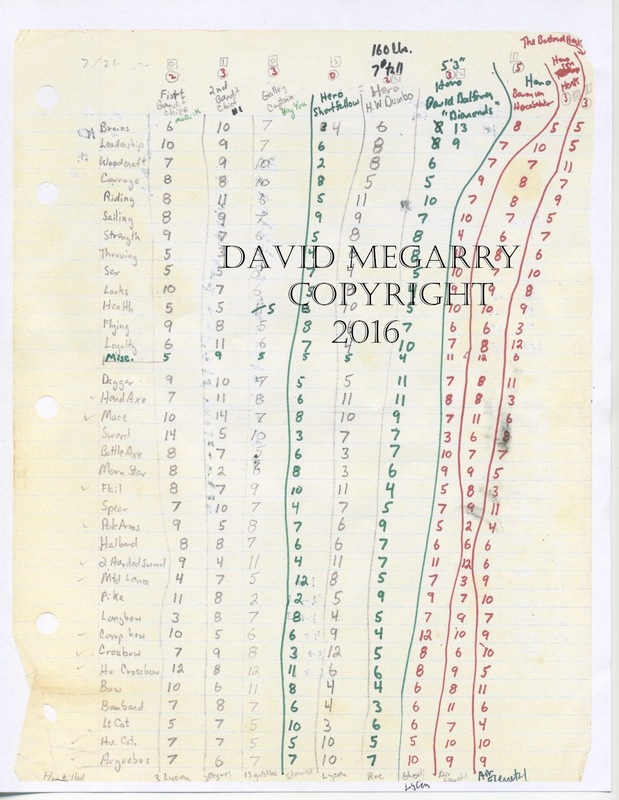 The illustration shown here is of two Blackmoor character sheets dating to circa 1971* belonging to David Megarry. These are his sheets from his play in Blackmoor. As such, they are a key witness to the early development of fantasy role playing games, and contain some of the very first "player characters" ever created. Two plus years of gaming! What is immediately surprising about that, is that we have a fairly entrenched concept of Arneson's gaming rules as being very fluid and evolving, yet these sheets evidence a much more stable situation within Blackmoor game mechanics than we had supposed. Arneson's rules were fluid and evolving, certainly, but that variability now appears to have been a case of fluctuating rules at the margins built around a more stable, character centered core. Nevertheless, such changes as we do find evidenced in the sheets are terrific clues to the growth of the game. I'll start with four important observations. First, when the character David "Diamonds" Balfour was created, a miscellaneous category was added to the character traits list. - written with green felt pen. 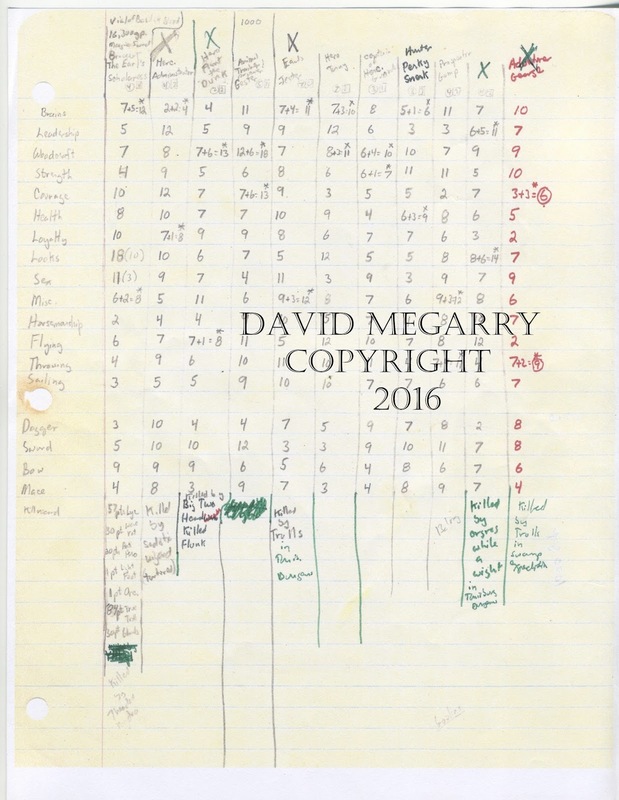 Dave Megarry says " The misc. line was added... I think Arneson wanted to streamline non-typical situations." Second, when the Hercebeiner family was created, a new stat was added to all the characters. This stat was written with a red felt tip pen near to the character name. 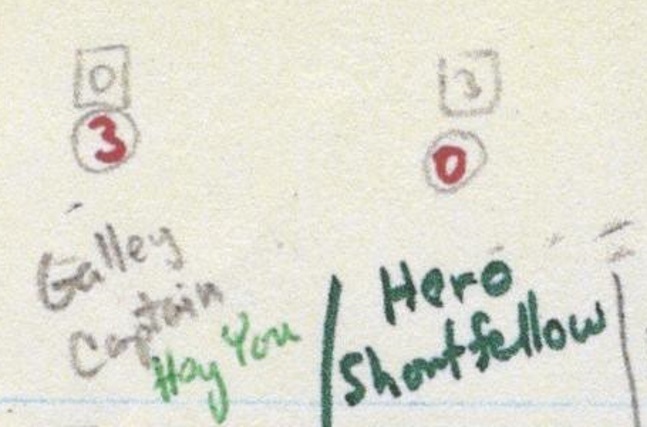 Third, prior to, or simultaneous with the creation of the first character on the second sheet (The Earl's Scholaress nee Scholar) another new stat was created and again placed near the character name. To distinguish this stat from the previous new stat, a square was drawn around it, and a circle was draw around the previous stat. Note that the very last character created - Adventurer George has neither of these stats. Fourth, while The Earl's Scholaress nee Scholar character was in play, a bonus system was instituted allowing two traits per character to be raised by 1d6 points. The new total was marked with an asterisk. I'll be going through these character sheets in a series of detailed posts, so I'll leave it there for now. Next post, we will talk about dating and content in comparison with Pete Gaylords character sheet. *There appears "7/21" or "7/71" in the top left corner which might be a date, which might have been written in 1971 or 1972 (or not). 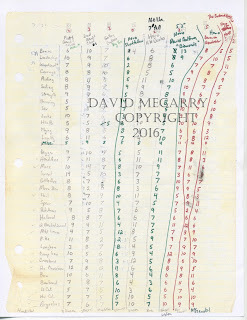 The first Blackmoor game is supposed to have taken place in April of 1971. Arneson subsequently went on a long trip to Scandinavia, but returned in July. A date of 7/21/71 would be entirely consistent with the known chronology. On the other hand, a date of 1972 would be consistent with the release of the second printing of CHAINMAIL, as mentioned above. 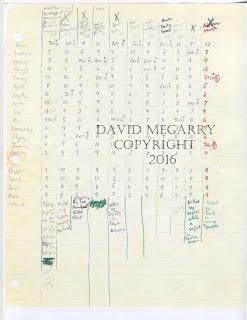 There is a faint hint of some additional writing after 7/21 that might be a 2, though it doesn't appear to be very consistent in shape with the other numbers of similar size on the page. Just in case your head has been in the sand, I thought I'd join the heralds and help make sure everyone is aware of a documentary - the documentary - in production which critically and thoroughly examines the genesis of fantasy role playing games in the Twin Cities. I'm not directly involved in the production, but I regularly consult with the producer, and I can state unreservedly, that the project is in excellent hands. The perspective being taken is anthropological, scientific, artistic and documentarian in the tradition of the greatest and best documentaries.